If you’re raising kids, you are constantly dealing with emotions, yours and theirs. One emotion in particular that has lately become more prominent in my 4 year old son, Onetime, is anxiety. Today’s post will share great ideas that I have found for helping your child deal with this uncomfortable emotional state. After recently taking a parenting Emotional Wellness course, I learned that difficult emotions like anger, anxiety, and sadness are really expressions of other deeper feelings. Check out the emotions wheel below. You will see that feeling scared can often be a result of feeling a variety of different ways. 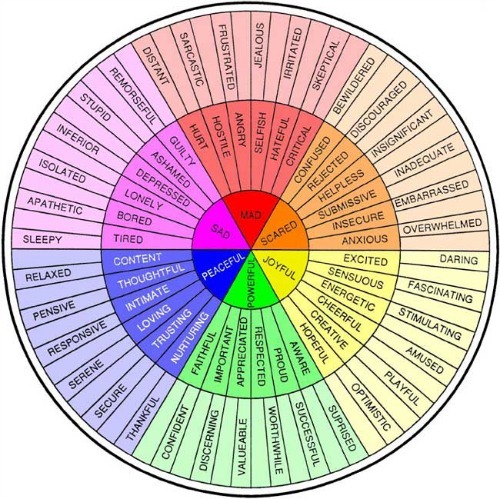 The emotions we often see are the ones in the center and the underlying feelings are on the outside of the wheel. For kids, most fear and anxiety comes out of feeling insecure, confused, helpless, embarrassed and/or overwhelmed. With my 4 year old son, I have started to see some anxieties developing around fear of the dark, “monsters” and bad dreams. I had extremely vivid nightmares as a child too and it was easy to empathize. But what could I do to help? Well, first of all, we talked about how dreams are not real of course, but after he mentioned it for the fourth or fifth time that day, I realized that he still needed to get the anxiety out somehow. What we ended up doing was drawing the dream. 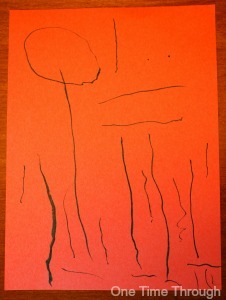 I got my son a marker and some paper and said, “Would you like to draw what the scary man looked like?” and he agreed. Here was his drawing and he could tell me what each of the parts was. As he was drawing, I asked questions, and empathized A LOT! Now, I’m not a psychologist, and this is not professional advice, but it really worked for my son. I didn’t hear any more about the scary man with the funny head after we were done drawing. In fact, by the time he was done drawing and we were done talking, my son was giggling about how “silly” the man looked. It was like putting him on paper took the dream’s scare power away. Onetime seemed to need to be heard in order to let this anxiety go. And isn’t that true for most difficult emotions with kids? I learned so much about empathizing, and the importance of acknowledging your child’s feelings from reading How to Talk So Kids Will Listen & Listen So Kids Will Talk . 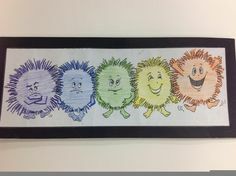 The authors, Adele Faber and Elaine Mazlish, advocate using drawing with kids when they are angry as well and I can see why that might help after using it with my son the other day. Now I know that there are all kinds of causes for anxiety in kids, and your child may be experiencing something altogether different from mine. Think about ways to prevent anxiety. The Tribes program Tribbles activity (see below) was a favourite circle activity for students when I was teaching. You can make your own version easily. Basically, you just have your child point to the character that best represents how they’re feeling at the moment and then you can have a discussion about it. 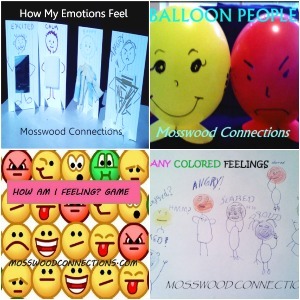 The Mosswood Connections blog has an amazing collection of ideas that are engaging for kids of all ages that will help teach emotional literacy. How we speak to our kids when they’re upset can make a huge difference to how they feel. The other day a friend told me about how her daughter was having difficulty adjusting to a new preschool program. She was crying when they arrived and continued to cry the entire hour of the first morning. She was experiencing overwhelming anxiety. It was said for all the right reasons, but unfortunately, being told to basically “stuff-it” was probably the least helpful thing this teacher could have said to this child. What Can You Say to Help an Anxious Child? So what CAN you say instead to a child in the throws of an anxious upset? How about, “You look really upset. It can be very hard to be away from Mommy and start school on your own,” or something similar. According to Dan Siegel, author of The Whole-Brain Child: 12 Revolutionary Strategies to Nurture Your Child’s Developing Mind , even just giving a child’s feelings a label (e.g. “upset” in the example above) helps to calm down the emotional part of a child’s brain. He calls this strategy: Name it to Tame it! I’ve already written a few posts summarizing expert advice on helping kids deal with strong negative emotions. Cruising Towards Mellow, 10 Ways to Teach Empathy, and Helping Aggressive Kids share strategies from parenting experts on helping your child feel heard when they’re upset. Toddler Approved also has a fantastic list of Ways to Support your Anxious Child. Have your child try the drawing activity we mentioned above, or try Mosswood Connections’ Breath Support art activities. 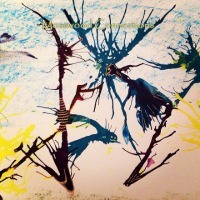 In addition to Drawing It Out, why not try Playing It Out? When my son, who is severely allergic to peanuts, had an unexpected reaction that ended in a scary ambulance ride to the hospital, we ended up “playing” out his anxiety over the next few weeks. Read about our experiences in D is for Dauntless. 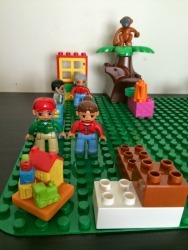 Play Therapy for Families Living Apart This brilliant mom found a way to help her sons deal with their upset emotions through play using Duplo and little people characters! Be sure to visit Mosswood Connections again to find their post that shares tons of other Tips for Soothing an Anxious Child. Sometimes having props for a child to use when they’re upset can help. My son and I recently found a wonderful kids book for 3-8 yr olds called, Angel Violet’s Magic Wings which takes kids through a relaxation visualization in the course of a fun little story. We also made a calming jar to use while reading this story. 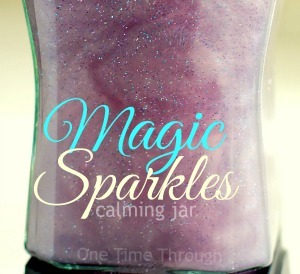 Click here to find out more about the Magic Sparkles Calming Jar. Create Your Own Anti-Anxiety Kit – great advice from a mom whose daughter is dealing with Post Traumatic Stress Disorder (PTSD). This Calming Basket would be simple to make. 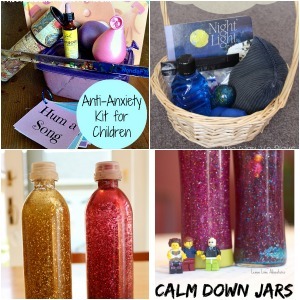 Glittery Calm Down Bottles – instructions for the bottles along with a discussion of a “peace corner” that kids can use when they’re feeling upset or stressed out. I love this toy-themed Lego Calm Down Jar for Lego lovers. I have found that talking in advance about situations that might be scary can be helpful. Reading books about things like the first dentist visit, or Kindergarten can also help prepare a child for the unknown. The trick is just to find the right timing – not too far in advance (or your child may lose some sleep! ), but far enough ahead of time so that your child doesn’t feel like they’re being thrown to the dogs, so to speak! 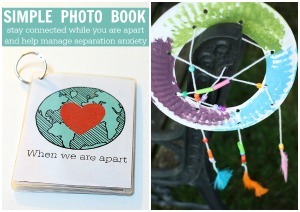 Why not try a craft project with your child that might help ease some anxiety? At the very least, doing a project together can provide an opportunity to do some of that supportive talking! Home Made Picture Books to take to school or to keep when parents are away. Paper Plate Dream Catchers to catch bad dreams. 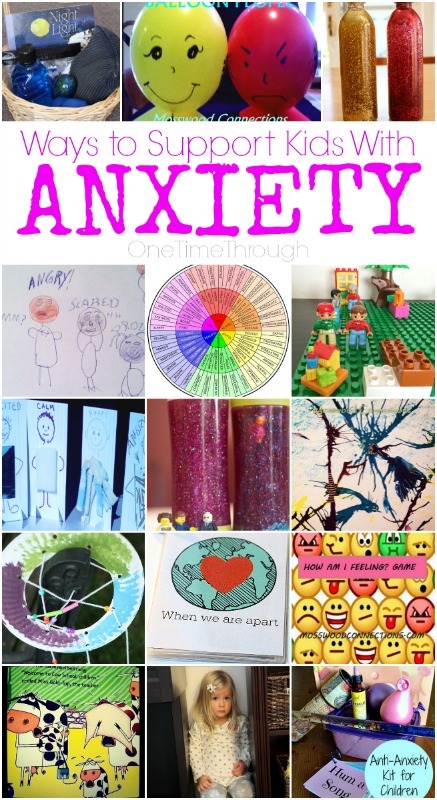 Do you have any more great ideas that have helped your child with anxiety? Please share them below! Previous Post: « Wonder-Full: 8 Ways to Help Young Kids LOVE SCIENCE! It’s great that your son is able to communicate some of his fears and dreams / nightmares. Talking about stuff is a great first step. Thanks for all of the other helpful ideas that I’m sure we’ll need daily in our house! Thanks for highlighting such an important topic. I woke up thinking about a boy I know who seems to be affected by anxiety, I was planning on calling his mom today but now I am going to send her this article. I particularly liked the part when you said that you aren’t a psychologist but it worked for your son. Mom’s know best! Thanks so much for including our post on social anxiety on the playground. I hope it helps someone out there! You have an awesome collection of ideas here — definitely using some in the future! Sue, this is an amazingly helpful post!!! We really try to encourage talking about feelings in our house before having outbursts. I really need to take the time to make some calm down jars. I think it would be fun, and sound like a useful parent survival tool!